Reliance Infocomm, ordered by the Supreme Court to pay remaining Rs 84.7 crore to the BSNL as charges on incoming international long distance (ILD) calls, today sought to make the payment through bank guarantee (BG) instead of straight payment by cash or cheque to the public sector company. 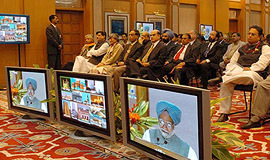 Calling for reaching out to a global audience with India’s message of tolerance and pluralism, Prime Minister Manmohan Singh today formally launched Doordarshan’s ‘DD Direct, the country’s only free-to-air direct-to-home (DTH) platform, with 33 television and 12 radio channels. Prasar Bharati and other ministry officials at the launch of India’s first direct-to-home broadcasting service at PM’s residence on Thursday. The Chandigarh Office of the CBI has asked public sector oil company Bharat Petroleum Corporation Limited (BPCL) to take appropriate action against its officials and dealers for the irregularities in the allotment of retail outlets in Punjab. Finance Minister P Chidambaram today said that the government was closely monitoring the movements in the price line of international crude oil and would take appropriate measures at the right time on the domestic pricing front. 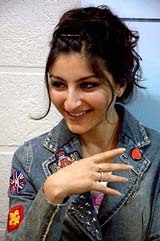 Upcoming film actress Soha Ali Khan displaying the "Oral Platinum Couple" ring in a promotional programme in Kolkata on Thursday. Telecom regulator Trai has postponed the announcement of reduction in Access Deficit Charge (ADC) in view of strong opposition from the incumbent operator, Bharat Sanchar Nigam Ltd.
Siemens said today it has bagged an order worth € 4.5 million to build mobile networks for railroad communication for the Indian Railways. The Centre today said that as many as 126 top-level executive posts were lying vacant in the Central Public Sector Undertakings (CPSUs). Replying to a question during question hour in the Lok Sabha today, Minister for Heavy Industries and Public Enterprises Santosh Mohan Dev said that the government was making efforts to fill these posts. The Calcutta High Court today ruled that Ms Priyamvada Birla’s will bequeathing the M.P. Birla’s property worth Rs 5,000 crore to her solicitor, R.S. Lodha be heard first and afterwards, if necessary, the Birlas will of 1982 could be taken into consideration. The BSNL had raised an amount of Rs 182.7 crore as penalty against the Reliance for allegedly re-routing incoming ILD calls as local calls, causing huge loss to the public sector company. While the rate for incoming international calls was Rs 4.55 per minute, the rates for local calls was only 30 paise per minutes, the BSNL had said. Reliance moved an application today for modification of the apex court order, which had given the company time till January 4 to deposit the payment with the BSNL. A Bench of Mr Justice N Santosh Hegde and Mr Justice S B Sinha, posted the application for hearing on January 3 after BSNL counsel Maninder Singh opposed it. Mr Singh told the Court that the BSNL has more claims against Reliance on this account as thousands of ILD calls to the BSNL subscribers through their system had been illegally converted by them into local calls, causing huge loss to the public sector company. The Court had issued interim direction to Reliance for making the payment earlier after examining the claims of the BSNL. Reliance Infocomm was to pay Rs 84.7 crore as it had earlier deposited Rs 58 crore and Rs 40 crore, the latter amount on the basis of an interim direction of the Delhi High Court. The Supreme Court had also referred back the case to the Division Bench of the High Court, which would hear the parties. It had fixed January 31, 2005, as the outer limit for the High Court to give its verdict on the petition filed by Reliance challenging the demand of Rs 182.7 crore raised by the BSNL. Differences between the Chairman and Vice-chairman of India’s largest business group Reliance Industries Ltd (RIL) could lead to a review of its debt rating, ratings agency Standard & Poor’s (S&P) has said. For the past few weeks, Mr Mukesh Ambani and his younger brother Anil Ambani have been engaged in a public spat over the “ownership issues” in the Rs 90,000-crore Reliance Group. “These differences could affect Reliance’s strategic direction, and a substantial change in Reliance’s business plans or the group structure will require a review of its rating,” S & P said in a report. S & P, which has a BB+ rating on Reliance’s $ 4.8 billion in foreign currency debt, said the power struggle had greater potential to weaken Reliance’s other businesses, including telecomms and power operations, rather than its core oil refining and petrochemicals business. Describing the DTH launch as a ‘landmark’ in the process of ‘emotional integration’, the Prime Minister said it had made possible to reach to the vast number of socially and economically backward people. The inaugural ceremony was held at the Prime Minister’s Seven, Race Course Road official residence in presence of Information and Broadcasting Minister S Jaipal Reddy and other dignitaries. DD Direct was scheduled to be launched on September 15, the Founding Day of Doordarshan, which had begun an hour-long daily telecast in 1959. However, the launch was postponed in view of the Prime Minister’s other engagements. Led by brand ambassador Mickey Mouse, Walt Disney makes its debut on Indian television screens tomorrow with the launch of two channels. The company is looking to break even in India in the next 4-5 years. “India is central to Disney’s international growth strategy and we would like to have long-term commitment in the market,” Walt Disney Television International President David Hulbert said today. Hulbert, who expects his channels to be watched by as much as 20 million homes in the next 12 months, said the company was hopeful that despite competition from channels like Cartoon Network, Animax, Pogo and Nickelodeon, the Indian market would expand further and present growth opportunities. Zee-Turner yesterday announced a seven per cent increase in subscription rates for its existing bouquet of channels from January 1. It also announced the launch of a new bouquet comprising five channels — Pogo, HBO, VH1, Zee Business News and TV18 Group’s New Hindi Business Channel, a company release said here. The bouquet, now comprising 25 channels, will be priced at a retail price of Rs 40 and a wholesale price of Rs 25 per subscriber per month, channel CEO Siddharth Jain said. Effective January 1, the price of Zee Turner’s existing bouquet will stand at Rs 58.85, incorporating the seven per cent hike, he said. The BPCL officials had allegedly allotted these petrol pumps flouting the eligibility criteria, and had reported taken money for the allotment of outlets. It is pertinent to note that the Supreme Court had also recently ordered the cancellation of a large number of petrol pumps due to alleged irregularities. Mr Aiyar disclosed that the ministry has also received a complaint from the Haryana Petroleum Dealers Association alleging corruption in the matter of allotment of petrol pumps to a mafia, which were reserved for the applicants belonging to the Scheduled Castes and scheduled tribes. The association has also alleged that some influential persons have been allotted benami petrol pumps in the state flouting all the rules and regulations. The complaint is likely to be investigated by the CBI. “The CBI had also investigated a complaint alleging irregularity in the allotment of a retail outlet at Pipar state highway in Jodhpur district and pointed out discrepancies in field investigation/physical verification of land by BPCL officials and recommended action as deemed fit,” said the minister. In reply to another question, the Minister informed that the Government of Assam had also referred five cases of pilferage of crude oil in Assam to the CBI for investigation. The ONGC has informed the government that one of their security officers was also involved in crude oil theft in Assam. He added that public should be aware that safety hazards were associated with the use of domestic LPG cylinders as auto fuel, and customers could use auto LPG available at the select petrol pumps in the region. “The Petroleum Ministry is watching the (global) petroleum prices and will take an appropriate decision at the appropriate time”, Mr Chidambaram said on the sidelines of a function on the Railways here today. He said that the view that prices of crude oil in the international market was going down was not entirely correct. “Where did you get the impression that petroleum prices have come down. It has again gone up today. Don’t jump to conclusions”, he said. Mr Chidambaram said that the Railways could still do better if they adopted best practices in raising finances and controlling costs. He said that there were huge opportunities to tap investments both from domestic and overseas sources. “Our decision on ADC was almost made. But the incumbent (BSNL) has protested and given us a long presentation, which we are examining. I think they will make another presentation after which we will take a final decision,” Pradip Baijal, chairman Trai, told newspersons here after an open house. “In the present exercise, the total amount going to the BSNL as the ADC is not being reduced. But since the number of mobile subscribers has gone up to 47 million, the regulator has the space to play around without reducing the total intake of the incumbent and the fixed line operator,” he said. “We are in favour of cutting ADC, on a per minute basis, and not the total amount of the ADC,” Mr Baijal said. He said no regulator could take lightly any representations from the incumbent (BSNL) as it is 60 per cent of our network, including that of the MTNL. So it is necessary to listen and understand the views of the incumbent. ADC is a levy on the private telecom operators, which goes to BSNL for undertaking rural telephony services. Mr Baijal said in a regulatory process, the regulator has to take into account all kinds of views and here the operator has opposed so TRAI has to listen to them and balance its action. Meanwhile, the government informed the Lok Sabha today that Trai favours lifting of the restrictions on coverage of news and current affairs. Siemens said today it has bagged an order worth € 4.5 million to build mobile networks for railroad communication for the Indian Railways. Achieving a breakthrough for the GSM Railway (GSM-R) communication platform on the Asian Market, the project will see Siemens equipping around 700 km of rail track for the Indian Railways subsidiary North Frontier Railways in the states of West Bengal, Bihar and Assam with GSM-R, a company statement said here today. GSM-R is based on the international mobile communication standard GSM and is used to integrated voice and data applications required for railway communications within a single system. Siemens will also supply Indian Railways with its solution, railway@vantage, which covers specific applications for train traffic such as Location Dependent Addressing (LDA) and Functional Addressing. Hutch, India’s only pure play cellular service and Indian Railways today launched ‘Railway Ticketing on Hutch’, a service that allows Hutch users in Punjab to book railway tickets on their mobile phones through simple voice commands. Hutch is the first and only cellular service provider to offer this facility to its subscribers. The Railway Ticketing on Hutch service is the result of a partnership between Hutch; Indian Railways and the IRCTC. The service is the single largest mobile commerce initiative in the country. The service was launched by Hutch in Delhi in September this year and is now being rolled out in phases across the other Hutch circles. Airtel today claimed that its Hello Tunes service has crossed the 2-lakh customer mark in Punjab, and the 1 million mark nationally, within 5 months of its launch in mid-July this year. Airtel Live — the company’s multi-access entertainment portal on the mobile phone, has also crossed the “5 Million-GPRS download” milestone during the same period. Announcing the launch of a few more Value Added Service (VAS) products, here today, Mr Mandeep Bhatia, Vice-President, Marketing and Sales, Punjab, today said “Buddy Tunes” has been launched as an extension of Hello Tunes. The Public Enterprises Selection Board (PESB) selects these persons for appointments and the appointments are made by the respective administrative ministries. “A prescribed procedure is to be followed for appointments to board-level posts in PSUs. Selection is normally made by the PESB and appointments are made by the administrative ministries after obtaining vigilance clearance from CVC and approval of the competent authority. Completion of these formalities takes time. Selection has been made in 35 cases. In the remaining cases, the selection process is already under way, except where the posts are decided to be kept in abeyance”, he said. The minister said that of the 126 posts of top-level executives, 30 posts are kept in abeyance by the administrative ministries/departments concerned by way of conscious decision. The concerned administrative ministry/ department/PSU makes alternative arrangements to look after the work of the vacant posts so that the functioning of the PSU is not adversely affected, the minister said. The government has approved voluntary retirement scheme (VRS) for the employees of Air-India and its subsidiary Hotel Corporation of India. This was stated by Minister of State (independent charge) for Civil Aviation Praful Patel in written reply to a question in Lok Sabha. To another query, he said Pawan Hans Helicopters Ltd might introduce helicopter service for the benefit of Amarnath pilgrims from next season subject to such a proposal being received from Shri Amarnath Shrine Board or Jammu and Kashmir government. To another question, the minister said the government of Maharashtra has already formed a Special Purpose Vehicle in the name of Maharashtra Airport Development Company to develop a multi-modal International passenger and cargo hub airport at Nagpur. 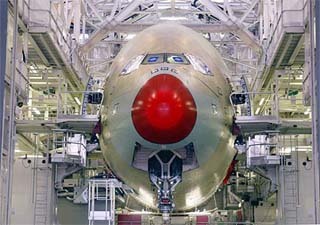 To another query, he said Indian Airlines planned to commence operations on Guwahati-Bangkok route from January 1, 2005. ABN Amro Holding NV, the largest Dutch bank, plans to cut 2,850 jobs, or about 3 per cent of the total workforce, as operating profit declines. The Amsterdam-based bank will save € 770 million ($ 1 billion) a year starting in 2007, ABN Amro said. Chief Executive Officer Rijkman Groenink said operating profit this year will fall as an increase in interest rates leads to a slump in mortgage lending and refinancing in the US, the bank’s largest single market. Justice K.J. Sengupta’s bench, which had been hearing the Birlas will controversy case for the past eight months where the entire Birlas family members and Lodha are locked in a legal battle over the ownership of the M.P. Birla’s property, came to the conclusion that the Birlas family members failed to justify their claim that the 1982 will should be dealt with and settled first before considering M.P. Birla’s widow, Ms Priyamvada’s will. The 1982 will had transferred Birla’s entire property to a trust for spending on some noble causes, since they had no children by birth or by adaptation. Model Lisa Ray at a promotional for Rado watch company in New Delhi on Thursday.